Frederick the Great of Prussia, engraved by W.W. Ryland after Antoine Pesne. The engraving is in the style of Thomas Billinge, whose work is also found on Liverpool porcelain: the form of the label bearing the subject's name is distinctive. The spatial relationship between the placing of the print and the handle of the mug contributes much of the visual effect. 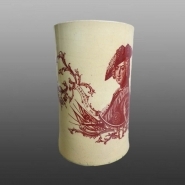 Creamware mug made by Josiah Wedgwood in Staffordshire and printed in red by Sadler and Green in Liverpool with Frederick the Great, King of Prussia, Britain's ally in the Seven Years' War against France. Sadler was printing in black on creamware for Wedgwood from 1761, but the first red prints date from 1763. 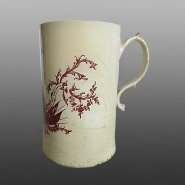 The deep color of the creamware indicates an early date for this mug.